Hello! Welcome to "Quiet, please. It's Snack Time! 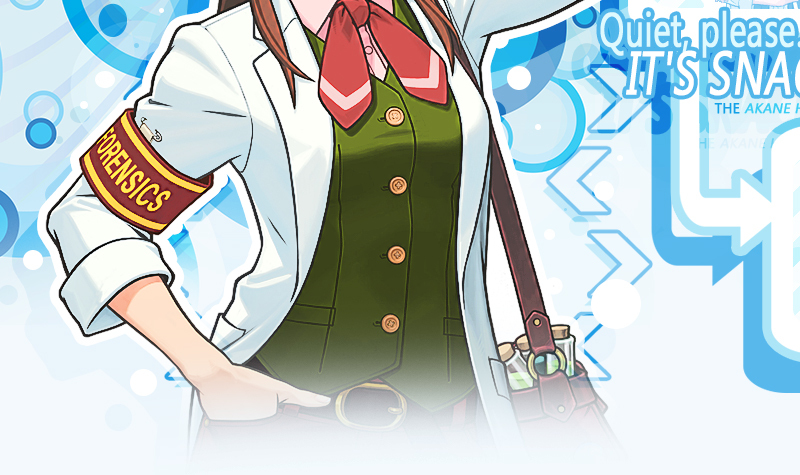 ", the TFL approved fanlisting dedicated to Akane Hozuki (better known as Ema Skye), an adorable and determined forensics scientist from the Gyakuten Saiban (or Phoenix Wright: Ace Attorney) series! Ema is the character from this game that more than any other made me think "I am like you". She worked so hard to reach her goal, she failed but she never gave up. She suffered her beloved older sister's death but her love for justice took her to challenge her old self to improve and overcome her weak points! She is also very funny, I adore Ema!! Please, choose a link from the left to fully access the site, and if you're a fan of Ema, feel free to join her fandom! Gyakuten Saiban is the property of ©Capcom, all rights reserved. This is a fan-site and I don't intend to violate them. Layout and contents ©Dorothy. Free Vector Design by vecteezy.com. The pictures I used to make the layout are from Zerochan.